This gentleman has been working here for more than forty years. The locker room is the main hang-out area, where men banter and discuss their lives. Women come to banya on alternate days. The atmosphere is very relaxed. You can let it all hang out and no-one cares. No-one had a problem having their photo taken. The chap in the middle is on holiday from Israel. This banya is one of the few places where you can find original Jewish Odessites. Classic Odessa footwear - also worn on the street with socks. One of the regulars shows off his locker. Many regulars bring their own thermos. Banya is like a second home. Old friends have been meeting here for decades. "It's very hot down there, so drink lots of water." Down in the banya it's hot, steamy and slippery. One of the regulars lies down, waiting for a massage. Oak leaves are used to beat the skin and improve circulation. Cooling off before heading back upstairs. Oak leaves often get stuck on the skin after a thrashing. Time to head for the bar. Men wander around the bar area in various states of undress. Some visit the in-house barber. A pedicure costs just over €2. The barman has been working here for forty-six years. Sergey touches the lucky fish as he eats his potato and pork snack. Another vodka before heading back to the banya. Sergey positions a leaf as his friend orders a shot. The combination of sauna, thrashing and vodka can be overwhelming. A local bigwig fresh from a thrashing. Boris is a local character and storyteller. He used to sail all over the world with the Soviet merchant navy. Alexandr prepares the branches while someone takes a break on the stairwell. Memorial to "Karaban" - a local gangster who was shot in this courtyard. Heading home feeling very relaxed. This banya predates the Soviet era. 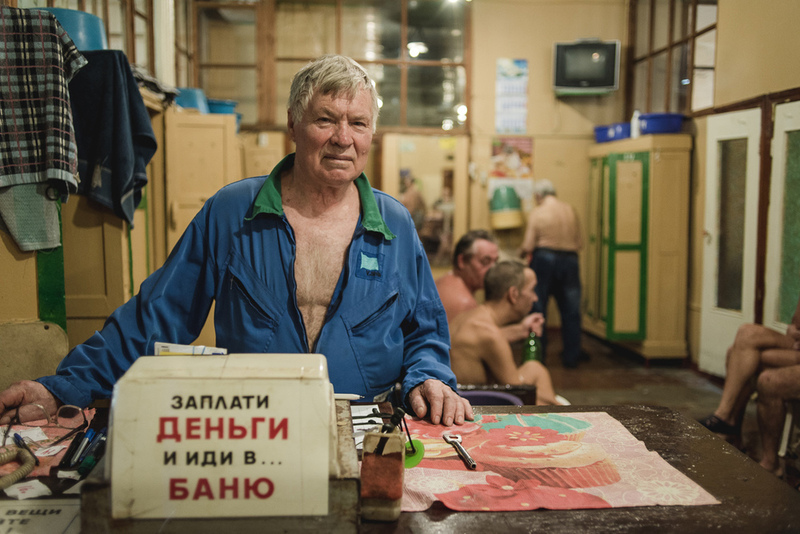 Most banya in Odessa have been replaced by soulless 'fitness hammams'. The Oldest Bathhouse in Odessa. A film by Dima Khavin.